Halloween Costume Idea #1 | Oh Sarah O ! ﻿Earlier this week, a friend of mine shared on Facebook that her daughter wants to be " Jesse (Toy Story 2), Woody (Toy Story), Mrs. Incredible (the Incredibles), the Itsy Bitsy Spider, Sully (Monsters Inc.), Mike Wikowski (I have no idea), Cinderella, a Princess, a Fairy, Spiderman, Superman, Batman and a lion." 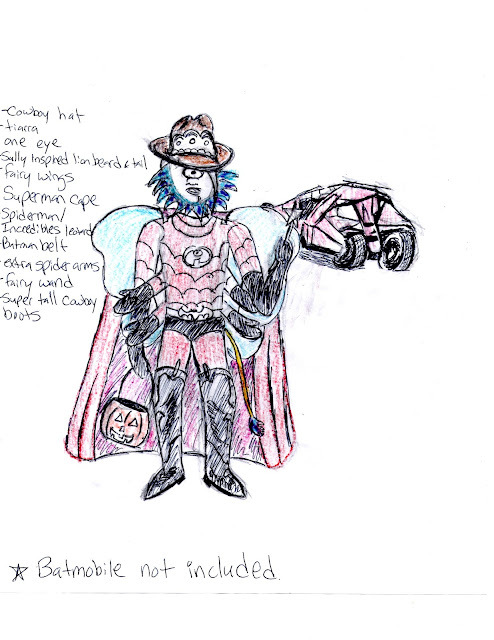 So, in an effort to help my friend accommodate all of her daughter's Halloween costume wishes, I created this Halloween costume drawing to help them out. What do you think? Are your eyes bleeding yet? Yeah. I thought so.